For the last five years or so, I’ve flown Southwest to almost every destination. They service my home airport of Baltimore Washington International and, mostly because I was lucky, they serviced an airport near wherever I was going. I’m a loyal customer because they provide a great service at a fantastic price, because they were almost always the cheapest. In the cases they weren’t cheapest, they weren’t that far off. One of the reasons why I liked them so much was because they don’t ding you with fees every which way. The price you pay for the ticket is going to be the price you pay to get where you’re going. 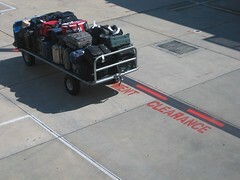 In an era when airlines will charge for you for the first checked bag, Southwest lets you check two bags without a fee. I wanted to specifically applaud the airlines that let you check in at least one bag for free – Air Canada, Air India, Alitalia, British Airways, Iberia, Japan Airlines, Jetblue, KLM Royal Dutch, Lufthansa, SWISS, and Southwest. Unfortunately, only two of those airlines (Jetblue and Southwest) are US carriers! Air Canada: First bag free, 2nd is $30 and 3rd is $100 ($90 if you pay online). Air France: It varies depending on origin and destination, check with Air France. Air India: First two bags free, third bag is priced based on origin/destination and is as little as $90 and as much as $133. AirTran: First bag is $15, second is $25, and third is $50. Alaska Airlines: First three bags are $20 each. Alitalia: First bag is free, second bag is $50, third bag varies based on origina/destination but it’s at least $200. American Airlines: First bag is $25, second is $35, and third is $100. British Airways: First bag free, second bag is $48-$60, third bag is $112 paid online or $140 in person. Continental: First bag is $25 ($23 online), second is $35 ($32 online), and third is $100. Delta: First bag is $25 ($23 online), second is $35 ($32 online), and third is $100. Frontier: First bag is $20, second is $30, and third is $500. Hawaiian Airlines: First bag is $15 ($10 interisland), second is $30 ($17 interisland), and third is $125 ($25 interisland). Iberia: First two bags free, third bag is €150. Japan Airlines: Free for first two pieces each no more than 50 lb. (70lbs. in first and executive class). Excess is charged based on weight and varies based on origin/destination. Jetblue Airways: First bag free, second bas is $30 and third bag is $75. KLM Royal Dutch: First bag free, second bag is €55, third is €200. Lufthansa: First bag free, second and third bags varies based on origin/destination. Mexicana: First bag free, second is $40, third is $150. Midwest: First bag $20, second is $30, third is $50. Northwest: First bag is $25 ($23 online), second is $35 ($32 online), and third is $125. SWISS: First two bags free, third varies from $200 to $350. Southwest: First two bags free, $50 for the third. Spirit Airlines: First bag is $25 ($19 online), second is $25, third is $100. For travel 8/1/2010 and beyond, the rates will change. Members of their $9 Fare Club will be charged $15 for the first two bags on domestic flights ($20 international) and $75 for the third ($80 international). Non-members will be charged $25 for the first two bags ($30 international) and $85 for the third ($90 international). US Airways: First bag is $25 ($20 online), second is $30 ($25 online), and third is $100. United: First bag is $25, second is $35, third is $125. Virgin America: First three bags are $25 each. easyJet: Charges each piece of luggage you check based on weight. The next time you’re flying, remember to take into account the airline baggage fees you might be charged! Ugh, baggage fees make me crazy! I miss the days when you only paid a fee if your bag weighed far too much. I always fly with Continental — I’m from Houston where their hub is, and I’ve been accumulating OnePass miles with them forever. But this baggage fee business is making me mad. I’ve started doing carry-on only whenever possible, even for overseas trips. A friend and I just booked a trip to New Orleans on Southwest because they’re having a crazy cheap sale, and while I don’t like the concept of first-come first-served seating, I’m really thrilled about the free first bag concept! It’s so customer friendly. More of the airlines should catch on…. This is a great list to use when comparing flight costs. The difference may only be a few dollars but it can add up. Plus it will make a big difference when flying with multiple bags for free or at $30/ea! If it were just a few dollars, like $3 or $5, then it wouldn’t be a big deal. The problem is that it’s often $25, $30! And Southwest gives you TWO bags free!